The Saudi-led coalition continued to conduct massacres against civilians. Coalition aircraft launched air strikes this morning targeting civilian houses in the Kohlan al-Sharif and Kushar districts of Hajjah governorate, killing and injuring 12 citizens. 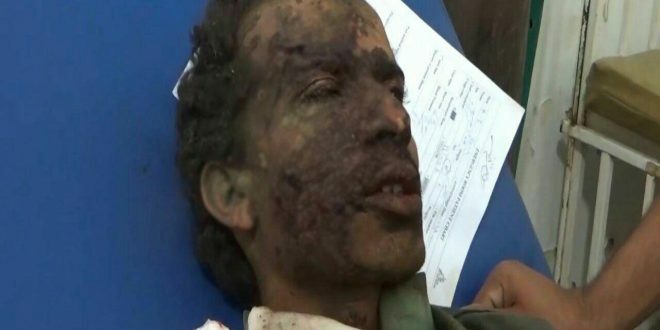 A local source in Hajjah province stated that the warplanes of the Saudi-led coalition targeted the home of a citizen in the area of Maghraba Qarhash, which resulted in a terrible massacre that claimed the lives of 3 civilians and injured another 9. The source noted that the houses of the neighboring citizens were damaged, adding that the rescue teams were unable to reach the targeted site to recover the bodies of the dead and wounded and save any people who are still stuck under the rubble but couldn’t due to the intensive hovering of the coalition military warcraft. The source added that Saudi jets had committed another massacre this morning in the al-Safra area in the Kohlan al-Sharif district, noting that the rescue operations are still ongoing and it the toll of the dead and wounded is still not reported till this moment.